You do not have to open a PayPal account to use the service. 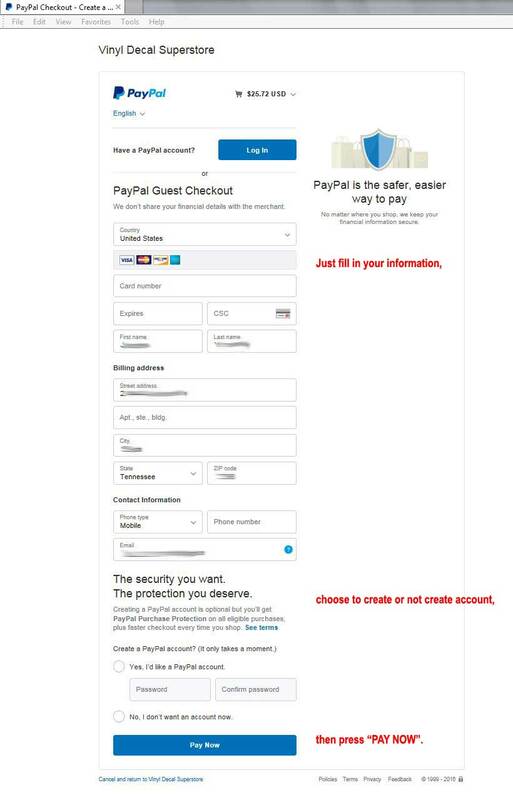 The following instructions will show you how to pay with a credit card or debit card using PayPal without signing up for a PayPal account. Paypal is a very safe and reliable method to pay for goods and services on-line because it allows you to hide your personal credit card information from the vendors you purchase from. As an example, we will never see your credit card number. PayPal abstracts the payment process and simply notifies us when it has completed and deposits the money in our account. PayPal doesn't charge us an additional monthly fee for this service and we pass the savings on to you! Step 1 - Proceed to checkout and select option to pay with PayPal. Once redirected to the PayPal website complete the form with your payment information and address. You may also log into PayPal if you already have an account. Step 2 - Review your information. Once you are ready click "Pay Now".